We need to hear from you in order to confirm your preferred day of the week. Our schedule fills up very quickly, so please call us at 817-616-1100! Not a Hero Club Member? You can join today! Reduce your Chances of a Major Repair by over 60%. You’ve made a significant investment in your home and your family’s comfort with your heating and cooling system. 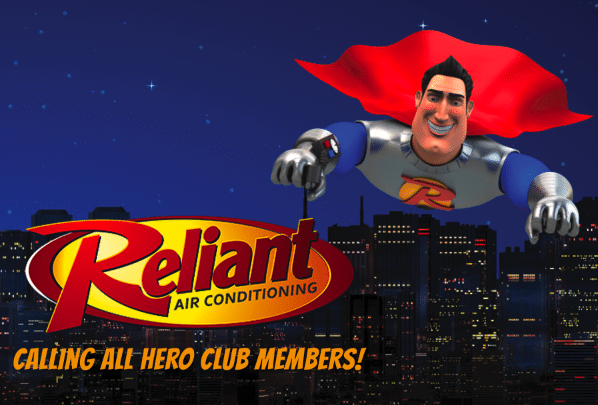 Protect your investment and keep saving money on high energy costs by joining the Reliant Air Conditioning Hero Club! We’ve been keeping homeowners in the Dallas-Fort Worth Metroplex comfortable for over 30 years. **Manufacturer Requires Proof on Maintenance performed on all equipment in order to honor factory parts warranty. Learn more about the Hero Club here!